This case study focuses on the implementation of an an iPad programme, at Longfield Academy in Kent (UK). Longfield Academy is a mixed secondary school for students aged 11 to 18 years of age. There are currently around 970 students at the academy, with around 160 of these in the sixth form. 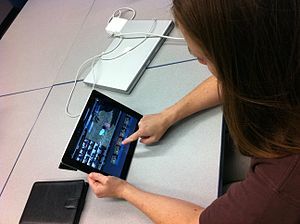 Overall, the case-study reported that the use of iPads has positively impacted learning and teaching. One teacher asserted that, “The iPads have revolutionised teaching”. I wasn’t so convinced that this case study added much to support the use of iPads in education. There did not appear to be a transition to a knowledge building approach by students, where they work on ill-defined problems, in authentic contexts to co-construct their own knowledge in context – in their community for example. Would be good to hear what you think…. As yet, data around improvements in students achievement has not yet been collected. Such devices cannot be dismissed as mere toys or distractions and while they bring with them technical and management issues, these are far outweighed by increased student motivation, progress and collaboration. Students using them regularly indicate that their iPads have become an indispensable tool, facilitating research, communication with teachers and, as in art, saving considerable time so enabling greater achievement. Teachers too, though perhaps with the same inbuilt cynicism that many have for any new technology, are very positive about the value of the iPads and articulate many of the benefits, not only for learning but for themselves. In the context of a restructured school in brand new buildings, to enable almost all students and all staff to have a new tablet device, one not designed for such a situation, and to integrate it into learning and teaching, as has happened at Longfield, would be considered brave by many. Yet the project proved to be extremely successful. While the technology has been an integral part of that success, a key factor has been the quality of the initial and ongoing project management, without which the outcome may have been very different. Sound change management principles have been applied and other schools intending to implement similar projects should learn from the experience of Longfield Academy. Get everyone involved –don’t let a perception grow that it is a ‘done deal’, even if it is! This entry was posted in All, Blended learning, e-learning, ICT Enhanced learning and teaching, Research and tagged Apple, case study, IPad, motivation, Research. Bookmark the permalink.